If you havent escaped to South America by now, this is where you should be. A complete, well informed and objectively written recap of the nights events can be found, in German, on Monsters of Göttingen. Another, significantly worse article, can be found at Göttinger Tageblatt. On the evening of the 27th of January police raided one of the „collective“ houses in the Rote Strasse, under the pretense of looking for evidence related to the „bomb“ which exploded several days ago in one of the government offices responsible for deportations. This incident occurred only two days after Göttingen authorities arrested and deported a man to Kosovo (see: „Protests Against Deportation“). The „lead“ which led to this massive police operation is apparently nothing more than a police dog which, five days later and despite rain and snow, apparently led police from the site of the „explosion“ to the entrance of the house on the Rote Strasse. This was justification enough to cordon off the entire Red Street with well over one hundred police officers for over three hours and proceed to a thorough raid of the house. In the course of the raid police confiscated three computers as well as other information storage devices. Not precisely bomb making material. The police also took advantage of the opportunity to carry out a further search warrant against an inhabitant of the house, in this case because of alleged property damage in the form of graffitti. The persons computer as well as several stencils were also confiscated. During the time of the police operation several hundred supporters gathered at the cordoned off corner of Rote Street and Jüden Street. Eventually this led to a „spontaneous“ demonstration through the city, during the course of which several store windows were smashed, at least one police car had its windows broken, and several small barricades were built. Five people were arrested during or immediately following the demonstration. Furthermore, approximately 50 people held a spontaneous demonstration in solidarity with the inhabitants of the Rote Str. in Hannover. 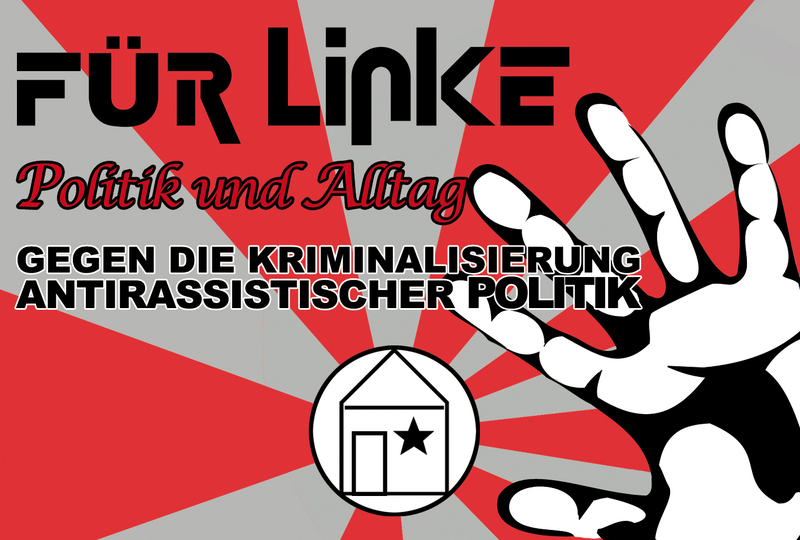 Most importantly, the inhabitants of the Rote Strasse as well as several autonome and antifascist groups are calling for a demonstration against repression and against the attempts to criminalize anti-racist solidarity. This demonstration is on Saturday, January 30th at 17:00 at the „Marktplatz.“ Put in few words: Be there! Polizei durchsucht Haus in der Roten Straße. Konstruierte Vorwände sollen Repression gegen linke Strukturen legitimieren. Gestern, am 27. Januar 2010, hat die Polizei eine Hausdurchsuchung in der Roten Straße 1 in Göttingen durchgeführt. Bereits gegen 19.00 Uhr hatte ein Großaufgebot an Einsatzkräften die Rote Straße abgesperrt. Anschließend wurden mehrere Zimmer von Bewohnerinnen und Bewohnern, sowie das Wohnzimmer und der Dachboden durchsucht. Darüber hinaus verschafften sich die Polizeikräfte Zutritt zu weiteren Zimmern. Polizeibeamten daran gehindert zum Haus zu gelangen. Die Sprecherin erklärte hierzu: „Es ist ein Skandal, dass ein Richter einen Durchsuchungsbeschluss auf einer solch vagen Beweisgrundlage überhaupt unterschreibt. Die Durchsuchung reiht sich ein in eine Vielzahl von Repressionsmaßnahmen gegen linke Strukturen.“ So wurde im vergangenen Jahr eine linke Wohngemeinschaft in der Geismar Landstraße durchsucht; ein Gericht hat diese Maßnahme mittlerweile für rechtswidrig erklärt. „Wir werden diese willkürlichen Maßnahmen nicht widerstandslos hinnehmen und verurteilen sowohl die Hetze gegen antirassistische Politik als auch die mit ihr verbundene Repression.“, so Sonja Meier abschließend. Für Samstag, den 30. Januar 2010, rufen die Bewohner und Bewohnerinnen der Roten Straße zu einer Demonstration gegen das Vorgehen der Polizei auf. Treffpunkt soll laut Angaben der Sprecherin um 17.00 Uhr am Kornmarkt sein. PS: Sleep is for the weak. Göttingen 27.01 19:00 uhr: Hausdurchsuchung Rote Str.! Edit 22:00 Last update for tonight. Demonstration in the city, small barricades, some damage to window fronts in the inner city, and at least one smashed up police car. At least two arrests. Edit 21:11: Cops leaving Rote Str., demonstration in the city. Edit 20:57: Demonstration in the city, 150-200 people. Cops still blocking the Rote Str. Edit 20:07: Over 100 people gathered at corner of Rote Str./Jüdenstr. in solidarity. Hingehen! It would be difficult to provide better entertainment: „Toto und Harry,“ two cops with their own television show who run around helping old ladies and getting cats out of trees, held a speech at a university in the city of Bochum. When they returned, they found all the windows of their car smashed and paint thrown inside. Funny enough, but Germanys finest newspaper, BILD, makes it even better with their article about the incident, in which they include a link to another article in which a speaker of the Police Union claims that „todays „chaoten“ are like the RAF“ („chaoten“ is a derogatory term usually used to refer to autonomes). Hysteria and exaggeration at their best. Every time I read it, the main question Im faced with is: If the radical left in Germany is so strong, so dangerous, so out of control, and so menacing…are we talking about the same Germany? *Speaking of lawlessness…here are some cops who clearly have trouble understanding the rules of some games. Slowly for the stupid kids here….dont bring your gun to the snowball fight. It just ruins it for the others. Du browst gerade in den Fire and Flames Weblog-Archiven nach dem Monat Januar 2010.